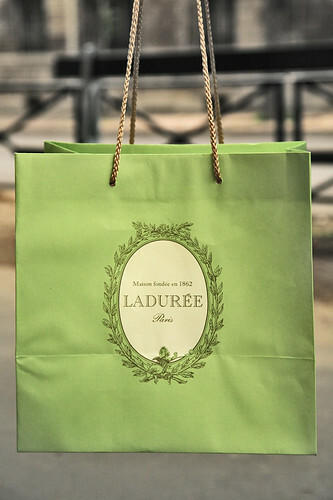 Oh, I stood in line for 25 minutes to get my Le Saint Honoré Rose-Framboise from famed patisserie, Ladurée. It was definitely well-worth the wait! The curls of flavoured cream had just the right hint of rose to compliment a fresh strawberry filling enclosed in buttery pastry layers. The raspberries on top were the freshest of its kind, and a lone rose petal sits daintily like a lady on top of the mound. 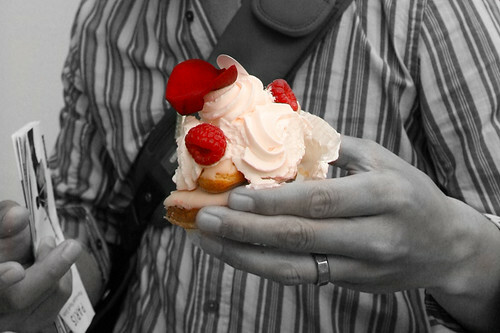 It was so delicious I almost ate the rose petal (seriously)! Of course, I couldn't forget my husband and child who have a penchant for chocolate. A pain au chocolat was the perfect antidote to distract them from the other goodies in the bag, including those world-famous macarons. Remember them heavenly treats from Sophia Coppola's Marie Antoinette? 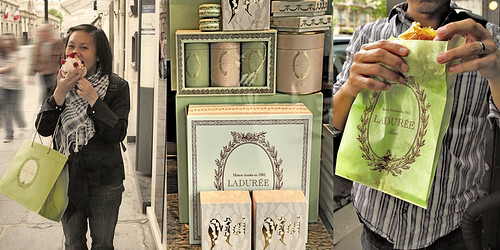 Yup, they're from Ladurée.